Have you ever been curious about what years of marriage people are most likely to get divorced? The answer (at least for the U.S.) has long been that the peak years for divorce are in the first five years of marriage. 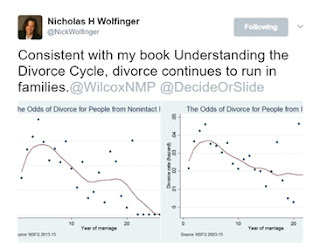 While a lot of divorce happens later in life, I am focusing here on how, for any given year of marriage, divorce is most likely to occur in the early ones. 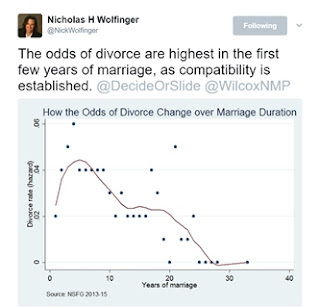 In contrast, the median years until divorce for those divorcing has long been something more like 7 or 8, but that’s a different statistic, representing the fact that of all divorces, about half are likely to occur before 7 or 8 years into marriage and about half are likely to occur after. I have not seen an update on that point for some time but I am also not closely tracking publications on that subject. Since many people are curious about this subject, I thought I’d post his tweets. Nick followed up his first post on this with a few nuances. I cannot make the charts format quite right when accessing twitter but you’ll get the point. There you have it. 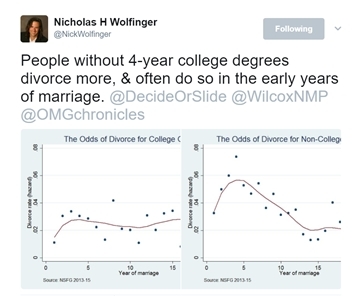 A little update via tweeter posts about how the early years of marriage are the peak years for divorce. Couples can thrive in many ways. As my colleague Howard Markman said long ago, Tolstoy was wrong in the opening lines of Anna Karenina when he wrote: “All happy families are alike; each unhappy family is unhappy in its own way.” It may be just the opposite; there is the most diversity and mystery on the positive side of how two people connect rather than the negative. Couples who are miserable tend to look pretty similar to other couples who are miserable with either nasty conflict or growing indifference—or both—being their way. There’s not a lot of creativity in all that, but there are an astounding numbers of ways you’ll see couples thriving in happy, healthy marriages. One of the things that can help keep your marriage strong is to do things together in some of the leisure time you have available. However, how this actually works out depends on if the things you are doing together are things you both like to do together. Some couples have a number of clear, common interests in what they like to do for fun, which makes it pretty easy to decide what to do when you have, or make, the time for it. But not all couples have such common interests, and if you don’t, it will take more thought and care to find what works. 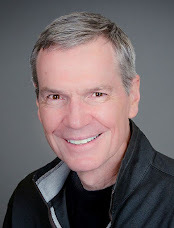 In a study from 2002 that remains one of the best ever on the topic, Duane Crawford and colleagues Renate Houts, Ted Huston, and Laura George described patterns affecting Compatibility, Leisure, and Satisfaction in Marital Relationships. They found that the way leisure time activities impact marital happiness is more complex than you might think it should be. Specifically, they used diary methods to study marital happiness in a sample that they followed for over a decade. They found that the pursuit of leisure activities as a couple was less strongly associated with marital happiness than most people believe. Crawford and colleagues found something obvious yet nuanced: the benefit in a marriage from spending leisure time together depends on compatibility in interests. Most tellingly, they found that is it no real boost to marital bliss, now or into the future, if a couple routinely engages in leisure activities that mostly only the husband enjoys. In other words, when women are going along to get a long, it’s a lose, lose deal for the marital quality of both partners. These researchers detail some of the reasons why women may be more likely to try to accommodate to their partners’ interests than men. Among the ideas they consider is a point made by Stephanie Coontz suggesting that, too often, husbands may not even be fully aware of their wives lack of interest in some of the things the husbands enjoy doing together because (some) women may be so good at covering up what they really feel about what things the couple do with their leisure time. Two partners don’t have to have all interests in common to have a great marriage. That would be oppressive and barely possible. However, when a couple mostly does things that are more fun for one partner and not the other, that comes at a cost. Crawford and colleagues also showed that spending a lot of time pursuing individual interests, each partner on their own, can be a sign of problems. Make a list. Couples will do best to find a few things to do for fun and friend time together that they both enjoy. This does not have to be a big list but it’s worth figuring out what’s on it. And communicating about that. Do you really know that your partner shares your fondness for golf? For eating out in sports bars? For lingering in art museums? Figure out the overlapping list and do some of those things regularly. Make the time and keep issues off limits during that time. This is, arguably, the most important advice about keeping fun alive in all the books my colleagues and I have written about marriage (for example, this one and that). Most of us are busy and distracted. To do things together, the first priority is to set aside some time for it. That can be a lot or a little, but it needs to be some. Second, and less obvious to many, you need to protect that time from conflict and issues. You can decide not to slide into letting issues and problems (that need solving) to be triggered in time you’ve set aside to be connected. Of course, then you also need to make time to deal with issues as issues, constructively. Speak up. If you are good faking it (you know what I mean), maybe that’s not doing your marriage any great favors. Sure, each partner should be willing to do some of the things that the other finds enjoyable even if it’s not high on one’s own list. That’s a signof a healthy relationship—not a problem. But if you know that the two of you are rarely doing “fun” things that you find fun, consider speaking up if you are not already doing so. Focus on enjoying being together. Compatibility in interests is a great strength in a marriage, but even where you are not compatible in your leisure interests, be fully present and work at enjoying that you are doing something together even if the current activity is not your own favorite thing. In light of the findings of Crawford and colleagues, I want to suggest that men, in particular, might need to step it up, here. Single and Searching? My advice for those looking to make a good match is a common refrain for me. Go slow. Be careful. Know what you want, and look for that. Don’t slide into situations where you increase your odds of settling for a relationship where you share little of the values and interests in life that make it easier to keep a marriage happy. You don’t need to find perfect compatibility. If that’s your goal, good luck with that. But it’s okay and important to look for the type of person with whom you can share a fuller life. Lastly, I want to suggest that it’s okay if what you do in your leisure time, together or apart, is not the most important part of why your marriage works. Knowing some ways to have fun together is valuable but it’s not the only thing. There are many ways to build a great life together.